Unusual storms and other weather conditions have raised the risk of flooding in and around NJ. In addition to causing water damage to homes, floods can also make it more challenging to perform termite control NJ services. Chemical products that are used to get rid of termites, called termiticides, are typically applied to soil. These products need to be able to permeate the soil in order to be effective. When the ground is wet from flooding, this can prevent termiticides from working as moving water and soil affect the treated area. Bait and monitor stations are commonly used to control termites and eliminate infestations in residential areas. Flooding makes this type of termite treatment more difficult since moving water can dump debris on these stations and cover them up. This prevents termites from entering them and carrying bait back to their nests. These stations can also be hard to find if they’ve been covered up. Flooding can also cause material used in monitoring stations to decay. Keep in mind that termite infestations can spread to other areas after flooding when tree limbs and fallen trees are tossed away. These should be checked for termites before being moved to any other location. Don’t wait for termites to take over your NJ home. Contact Allison Pest Control for more information on our termite control NJ services. What Are the Signs of a Subterranean Termite Infestation? Termites are among the worst kinds of infestations homeowners can have. These pests can cause tremendous damage to homes, which makes it important for homeowners to know the signs of an infestation. If you notice any of the following signs of subterranean termites, it’s time to seek help from professional termite control NJ services. Subterranean termites usually won’t make their home inside yours, but they will travel back and forth from their ground nest to your residence while foraging. If you see tubes in your home that have a muddy appearance, this can indicate that you have subterranean termites. These tubes make it safe for termites to forage. Keep in mind that these tubes can be hard to spot, but you will typically find them in certain areas, such as concrete foundations and walls. Wood damage isn’t always easy to see, but some signs include dark spots or blisters in wood floors. You can check for other areas of damaged wood from termites by tapping surfaces and listening for a hollow sound. The presence of swarmers means you have a termite infestation. You might see these winged termites around doors, windows and light fixtures. Swarmers, which fly out of nearby mud tubes, might also leave discarded wings behind. 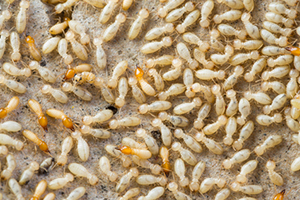 If you have termites in your home, give Allison Pest Control a call right away. We offer reliable NJ termite control services. What Do I Need to Know About Wood Destroying Insects Before I Buy a Home? Termites, carpenter ants, and other bugs that destroy wood can cause major damage to homes. In the worst cases, these bugs can make homes unsafe to live in due to structural damage. If you’re in the market for a new home, it’s important to learn more about these pests and the trouble they can cause. Termites and other bugs that eat or chew through wood can cause expensive damage to homes. In fact, termites alone cost an estimated $5 billion in property damage each year. If you buy a home with these pests in it, you might end up spending a considerable amount of money on repairs. Before you buy a home, it’s important to have an inspection done for evidence of termites or other bugs that destroy wood. Freehold exterminators can check your home for signs of damage from these pests. 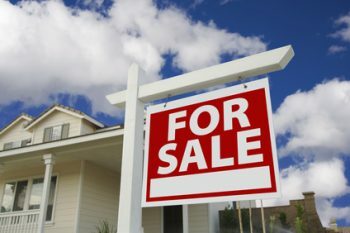 This can help you decide whether or not to buy the home you’re looking at. When you do purchase a new home, taking steps to lower your risk of having wood-destroying bugs is highly important. Pest control professionals offer prevention measures that can help keep these pests at bay. If you’re worried about termites in your home, don’t wait to call our Freehold exterminators for help. Contact Allison Pest Control, and we’ll inspect your home for termites and other wood-destroying pests. Termites are among the most common household pests. They can also be the most difficult to get rid of due to their numbers. One type of termite, known as the subterranean termite, can build colonies that number as many as 2 million. Subterranean termites are light brown bugs with long, thin bodies that have an oval shape. These bugs don’t just feed on wooden structures. They also eat plastic, plant-based fabrics and even wallpaper. 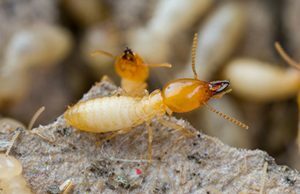 Subterranean termites cause the most destruction out of all termite types, thanks to the amount of wood and other materials they eat. When you have subterranean termites, they can destroy your home’s foundation, pipes made of plastic, insulation and the trees in your yard. • Don’t leave pieces of wood lying around your yard for these termites to eat. • Check water drains to ensure that they’re not facing toward your home. • Get rid of any water that accumulates around the foundation of your house. When you have termites in your home, it’s important to get rid of them quickly. Our Tom’s River termite control experts can help. Contact Allison Pest Control for more information. Are ferocious Formosan termites creating a Tom’s River pest control nightmare at your home? The experts at Allison Pest control are here to help you identify and fight these frightful creatures. Formosan termites are a subterranean variety of termite, brought to the U.S. in the 1940s from East Asia following World War II. They continue to be spread today via the shipping of wood and other cellulose-based goods. The largest and most destructive termite species, Formosans are 1/2-inch long with yellow-brown oval-shaped bodies, 6 legs, wings, and antennae. Straight out of a horror movie, Formosan termites create mud nests up to 300 feet long inside the walls of buildings, with tens of thousands comprising a single colony of workers, soldiers, and reproductives. They love to dine on dead trees, wood, and plant-based fabrics. • Ensure water drains away from your home’s structure. • Rapidly replace damp or damaged wood on the outside of your home. • Be wary of signs of Formosan infestation, including mud tubes, blistered or peeling paint, and wood that sounds hollow when tapped. Formosan feeding frenzy? 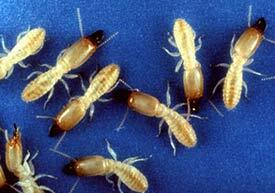 Termites are terrified of the Tom’s River pest control experts at Allison Pest Control. Contact us today.